A Yoga Class modified for pregnant and post-partum women. Staying strong and healthy during your pregnancy is vital to give you and your baby the best start in these new beginnings. Pregnancy yoga is a wonderful way to connect with your body and unborn baby during this very special time. Pregnancy often can bring on a natural inclination towards introspection and a deeper desire to connect with ones inner self and Yoga helps to strengthen this journey. Almost at the point of conception a woman’s body and emotions begin to change. The immediacy of this change is due to a special kind of energy that becomes active in a women’s body right after conception. 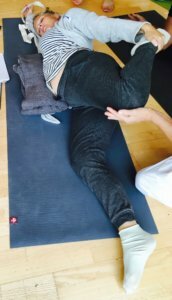 At Yoga 7 we can work together from the moment of conception right through until the point of birth, adapting the postures and breathing techniques. If you already have a regular established Yoga practise then not much needs to change. If you are new to Yoga then this is an excellent time to commence your practise and bond with your baby whilst it grows so too will you. A pregnancy yoga class will omit deep backbends, deep twists and poses done lying on the belly, for obvious reasons. Its important not to over extend during yoga while pregnant to avoid injury during and after pregnancy and birth. The hormone ‘relaxin’ is softening the joints during pregnancy and so they are more easily dislocated when over extending. We can use props such as a Swiss ball and chair, blocks and straps to help with your practice. A vital part of a prenatal routine is trying to relax the body and mind and so the guided 20 minute relaxation at the end of each Yoga 7 Class in Worcester will be of enormous benefit. Please do bring a blanket to get the most out of this relaxation time at the end of the class. With years of working with both pregnant and post- partum women Claire at Yoga 7 has done extensive training and study in the area of Pregnancy Yoga to ensure you and your baby get the treatment you both deserve at this very special time.